That is why what the Millennial Generation thinks matters. With recent headlines highlighting scandal and potential regulatory challenges for tech giants, just what are Millennials thinking? In part 2 of our survey we look at what Millennials think about the relationship between big tech brands, society and government. Q. Do you believe that executives at tech companies are more concerned with doing the right thing for society or making a profit for shareholders? While respondents reported positive sentiment toward big tech brands, over half believe that when it comes down to a choice between doing the right thing for society and making a profit for investors, tech executives will pick profits. Q. Do you believe that tech companies should be more regulated or less regulated by the government? 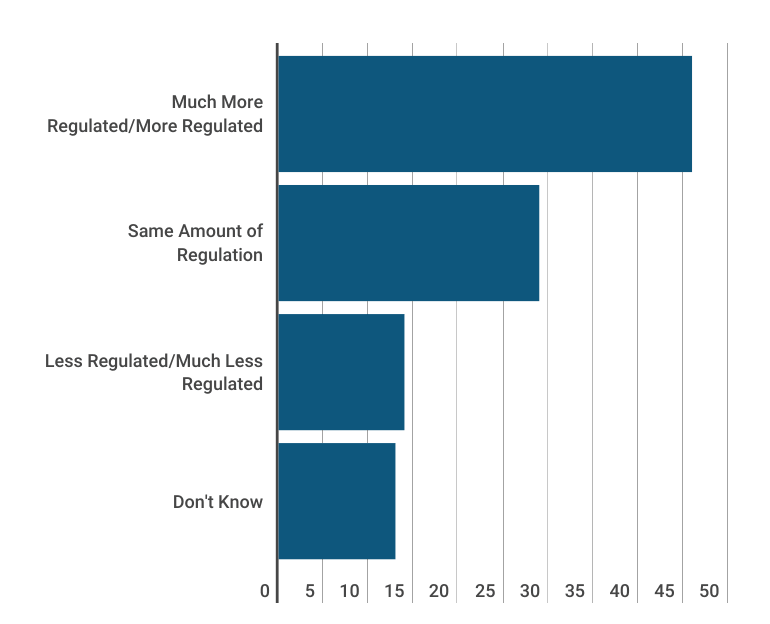 Just under half of respondents believe that tech companies should be either much more regulated or more regulated, while just under a third believe that the current level of regulation is sufficient and just under 15% feel that tech companies should be regulated less. Millennials report healthy skepticism when it comes to tech companies and their position in society. Despite a majority of respondents reporting that government regulation of tech companies is either sufficient as is or less regulation is required, two thirds of respondents agree with the statement that tech companies have too much power in American society. There's more disagreement amongst respondents when asked whether tech companies will do the right thing for American society if left to their own devices. A plurality of respondents do not believe tech companies will do the right thing for American society if left alone. Publitics surveyed 400 U.S. Millennials through online opt-in surveys. Care was taken to ensure that the sample was demographically balanced during data collection.